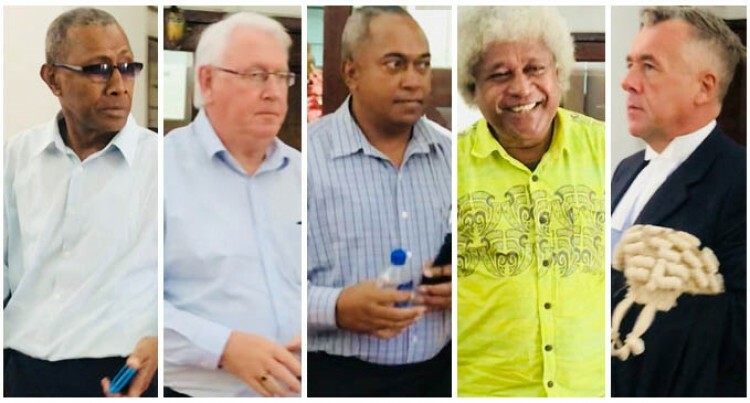 All counsels in the Fiji Times alleged sedition case will make their closing addresses to the three assessors on Tuesday. This was determined at the close of proceedings yesterday. Justice Thushara Rajasinghe ordered counsels to file and serve written submissions by Monday afternoon. In his opening address, Fiji Times lawyer Wylie Clarke said there were two parts to the case against the newspaper company. He said the first part was that the defence said the letter in question was not seditious. He said Linguistics Professor Paul Geraghty would translate the letter about what it said to prove that it did not say anything remotely close to what the prosecution claimed. Mr Clarke added that Nai Lalakai was not a radical newspaper. He said the second part of the defence case was related to the fact that the company was charged in the case. He referred to the company as an “artificial person” that can only do things through its people. He said only the acts and state of minds of the company’s most senior people mattered which were the Board of Directors and Senior Managers including the third and fourth accused persons; Fred Wesley and Hank Arts. Mr Clarke told the assessors that it was not disputed that the letter was published. However, the question was if the letter was published with the approval or authorisation of the Board or Wesley or Arts. He added that the company maintained that no authorisation or approval was given. He said Fiji Times had a very strong and robust system of training to ensure common decency and respect for all members of the community. Mr Clarke reiterated that the company’s case was that systems were in place to ensure that standards were met and maintained. University of the South Pacific (USP) Social Professor of Linguistics Paul Geraghty gave evidence on behalf of Fiji Times yesterday and said he had read the alleged seditious letter about 5-10 times. He said the letter referred to historical events and anyone reading the letter in Fiji would not relate it to any events locally. Mr Geraghty did not agree that the letter would stir up feelings of hostility within ordinary Fijians who were not part of the Muslim faith adding that he had personally read the letter and did not feel any hostility towards Muslims. He testified that he did not see any threat of action in the letter against anyone. Mr Clarke told him that the Prosecution had claims that the language used in the letter was extremely inflammatory and could lead to public disorder. Mr Geraghty responded saying the Nai Lalakai readership was quite small and it was largely made up of rural dwellers who read the publication for sports stories and oral traditions. He said the letters in Nai Lalakai mainly centred discussions around religious issues, adding that he did not think anyone reads Nai Lalakai for its political content. He told Mr Clarke that the article did not contain insensitive statements against Muslims. Mr Geraghty commented that there was plenty of evidence that other Fijians and Muslims got on very well and to suggest that statements were insensitive was rather ‘far-fetched’. Mr Geraghty told Josaia Waqabaca’s lawyer that he was considered an expert in iTaukei language. Responding to questions Mr Geraghty said there were approximately 300 versions of the iTaukei language with Bau dialect being the standard iTaukei language. He said it was a common belief that the iTaukei language was limited compared to the English language, however it depended on the field being discussed. He agreed with Anare Ravula’s lawyer that Waqabaca had put the words ‘national reconciliation’ in his original letter. Munro Leys lawyer and partner Richard Naidu told the court that Fiji Times was a client of theirs and the nature of services they provide was across the board. He said on the news side of things the majority of the work done was for pre-publication. He said this involved reviewing contents of the newspaper before it was published so that it was legally compliant and did not defame anyone or is not in breach of the Media Industry Development Decree. He said apart from himself two other partners within the firm namely Jon Apted and Nicholas Barnes, deal with Fiji Times as a client. Mr Naidu said a lot of their work involved addressing queries from the Editor-in-Chief, Chief Sub Editor and Senior Reporting Staff and sometimes from junior reporters. He said anyone of the editorial staff could contact the firm if they had any queries. He testified that once they received content from staff they are reviewed adding that very hardly do they advise against publishing content. He said more often they would recommend changes to certain paragraphs in a story but 75 per cent of the time they would approve stories. The Court heard that the newspaper company had a progressive approach to media exposure and content was referred to the lawyers on a “just in case” basis in case the lawyers picked out content that the staff members did not. He said the system of liaising with the newspaper company was in place in 2016 and everyone in the newsroom knew that the lawyers were available to them. Mr Naidu said he conducted one-hour training sessions with the editorial staff on issues like defamation, contempt, Police and crime reporting, the Media Decree, Parliamentary procedure and court reporting. Mr Naidu testified that he did not do a lot of work with Nai Lalakai because they were a weekly publication and there was less deadline pressure compared to the English language newspaper. However, he said there were times when Nai Lalakai content was referred to them and the necessary procedure was followed and advise given. Mr Sharma asked Mr Naidu if he was aware that MIDA (Media Industry Development Authority) had the right to write to a publication company and ask them to correct anything that is printed. Mr Naidu responded saying MIDA could refer a complaint to which they would respond to however he was not sure if MIDA could compel a correction. Mr Sharma questioned Mr Naidu if the firm received any request from MIDA for retraction of the letter in question because it contravened the standards set up by MIDA under Section 36. Mr Naidu said they did not receive any request. He said he did not receive any complaint from MIDA about the Nai Lalakai letter. Mr Corlett asked Mr Naidu if Arts had approached them in relation to any pre-publication matters. Mr Naidu said no, adding that the Publisher does not send them copies for review. He said that was the general practice of any good newspaper was to maintain editorial independence. He said he liaises with Wesley at least once a week but generally he speaks with the sub editorial staff. He said Wesley was quite conservative because he would contact them if he saw any potential risks. Mr Naidu told Mr Burney that if any of his law partners received any complaints about the Fiji Times he would have been informed about it. He testified that one of the reasons the company took a conservative approach was for fear of legal jeopardy or prosecution for an offence. Referring to various sections in the Media Decree Mr Naidu told Mr Burney that he could not say for certain that he conducted trainings specifically on the sections, however, it would have been covered as it was relevant. He confirmed that consequences arose as a result of the letter in the form of Police investigation. Mr Naidu said Arts was at liberty to contact him at any time he wanted bearing in mind that the firm also provides work outside editorial. He said there was no law which prohibited Arts from contacting him about newspaper content, however, Arts was not responsible for editorial content. However, it was something that was not done and something that the publisher did not do. On the issue of editorial independence, Mr Naidu said it was a concept which kept the editorial section of the newspaper separate from advertising and commercial sections. He said this was to ensure that the content was not influenced by the owners and advertising interests. Mr Naidu was then asked to give a distinction between a publisher and a general manager to which he said the Media Decree required a person to hold the position of Publisher adding that the general manager was concerned with the commercial arm of the business. He testified that the Newspaper Registration Act required a person to hold the position of Publisher for the purpose of registration. All accused men are on bail.